Speaking at the first ever Tech Meetup at the White House and speaking from the same podium President Obama stands behind wasn't on my bucket list, but now I can add it and check it off. This was an amazing opportunity to learn and share with approximately 50 community organizers, and 70 city and state officials, and local community technology leaders from across the country. The goals in gathering were to support America's innovators, to better bridge digital divides, to interconnect us on common topics, to better collaborate on challenging projects where we have deep need and passion to solve them, and figure out how to include all Americans everywhere in our #InnovationNation. 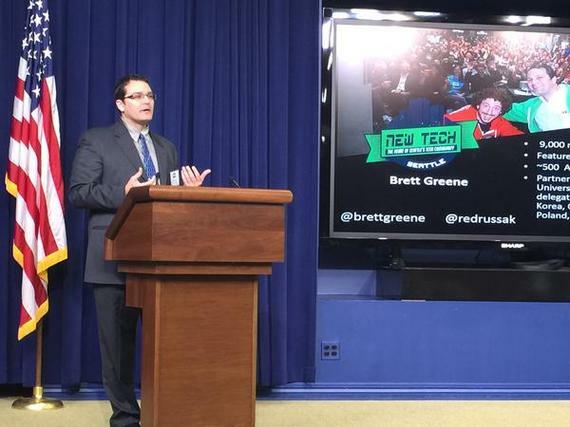 The Tech Meetup at the White House was created to bring together thought leaders from across the US and to show support for America's tech community. This event served as a platform to encourage collaboration, foster new partnerships and fuel the passion that will help move the industry forward. After attending Colorado New Tech for 6 years and then launching New Tech Seattle 2 years ago, community building has been running fast in my veins. The secret sauce of tech meetups is that beyond building communities, they create leaders who go on to empower more people and groups to give back and help others. While over 9,000 groups meet every day, millions of people still have never heard of these powerful events that change people's lives. "Tech meetup organizers represent the incredible local community organizing that happens every day across this country, connecting people who share common passions and who would otherwise be strangers to one another," said Megan Smith, White House Chief Technology Officer and Assistant to the President. "By sharing your talents and knowledge with your neighbors and peers, organizing meetups, investing in people's development, and helping connect people to reach their goals, you're keeping our nation on the cutting edge of innovation." "We also know that more Americans need to plug into the new interconnected ecosystems we live in, to surface their talents, and connect them to opportunities they deserve, and we know that there are more ways than ever to leverage networks and technology to improve lives. We have a lot of work to do to bridge connections and ensure all of our neighbors can participate," reflected Smith. In bringing together this group of community influencers we were able to connect and support each other in looking at how to better serve our individual communities, as well as how to help other cities begin to use these tools to create jobs and empower their residents. The main trend expressed by the attendees was a commitment to help minorities, women and military veterans have greater access to education in technology fields. Software development and website development training programs are proliferating in many cities while these populations are still very underserved. These courses provide training in skills that are in high demand in well paying fields which can drastically improve the income of their graduates. By helping more people with fewer means to experience education in technological fields, we help our local communities as well as our nation. As more opportunities are created through our neighbors discovering the power of meetups, our communities will flourish with innovation and opportunity.